Trump is gone ...and a new political party emerges in the US that isn’t controlled by greedy corporations and corruptible misogynist dinosaurs. The American voters go back to voting on policies, not stereotypes and hatred. Wouldn’t that just be so awesome? Is it illegal to dream these days? Political leaders finally realize that smartphone addiction is the worst disease to affect society since cigarettes and booze. In fact, it’s worse – they could fund entire health, military and education programs taxing booze and ciggies, but with smartphones, all the money is now getting sucked offshore somewhere, and into Mark Zuckerberg’s and Jeff Bezo’s bank accounts. Re-open pubs and bad discos. Back in the pre-smartphone era, our social world was centered on bad pubs and even worse dance floors. Yes, we had to get drunk and make idiots out of ourselves to meet people and get married… now it’s just swipe left or right, a few photos and you’re all done. Where did all the “fun” go? Can’t governments declare what’s left of our pubs as places of national heritage and conserve what we have left of life before Instagram? Is the joy of youth consigned to sharing bad selfies and playing online video games alone in their bedrooms? Tax gym memberships. What was wrong with a few extra pounds and a beer gut? Now, if you don’t have a perfect six-pack on your chest, rather than in your fridge, you’re not exacty making friends like you used to… where did all the fun go? Not sure about you, but I don’t have much energy left for socializing after 45 mins on the treadmill and benchpressing 130lbs, so I might as well donate the $20 I should be spending on booze to the government to fund the reopening of classic pubs. Tax anyone trying to buy Bitcoin. Just because. Tax vendors double for sponsoring every ropy conference under the sun. They’re wasting their money in any case, so why not make them do something useful with it? Place income tax on robots. This will end the inane conversation about “digital” labor, as everyone goes out of their way to call it something else, like workflow efficiency… which is what it really always was, right? Tax #fakenews. Forget the detritus of Obamacare, this will fund a whole new health system, right? The Bottom-line: As we near the end of a ridiculous year, we can all dream, can't we? Phil - you don't like Trump? I am shocked! Yes please!!! Tax fake news and bring back pubs and disco places :-) Have a good holiday!!! From a proud user of the GF Grill, I find this offensive. Time to tax robots. Yes. 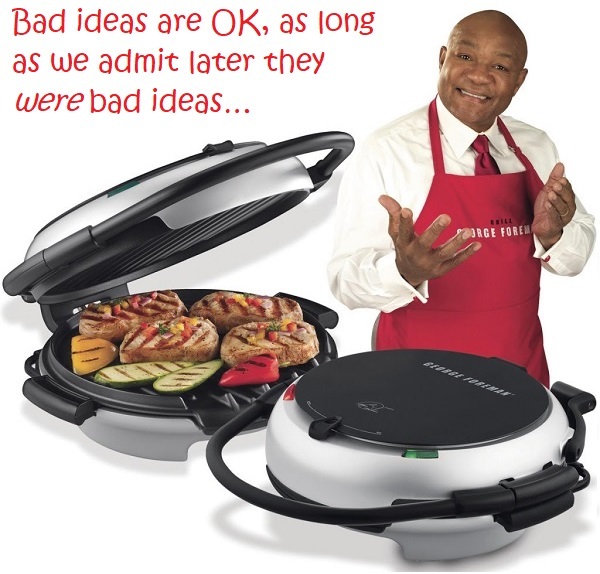 I agree with John - the George Foreman was a great idea! It just hasn't moved with the times - where is the IoT integration? This is hilarious - thanks Phil!